06 Nov Where Do You Need Pull-Out Drawers? I’m sure you’re just like the rest of us, you too are trying to use every bit of space in your home to store items you often use. Sometimes simple items make storing your clothes and other items just that much easier, such is the case of a pull-out drawer. We’ve all seen the great kitchens or expansive closets that look great and make our jaws drop with their luxurious finishes. The real secret to making any storage cabinetry successful is how you use it. In this article, I’ll expand on the joys of pull-out drawers. Kitchens are one of the best places to use a pull-out drawer. How many times have you reached into one of the lower cabinets and though you need an arm as long as an orangutan to reach anything in the back of the cabinet. The ease of a pull-out drawer on full extension glide is absolute dream. No more reaching back! Pull-out drawers are a great way of managing heavy pots and pans as well. No more clutter, all of your pots and pans tidily stored within hands’ reach. Keep in mind, pull-out drawers can make spaces you’ve never thought of using much more accessible and useful. One of our customers had their old broom closet changed over into a pantry. Since most closets are quite deep, usually 24” or more, pull out drawers were a great way of using that large space and still make it practical. Bathrooms often have great vanities nowadays as well. The space under sink is always problematic since you have to work around the plumbing. This is not a problem for our ingenious designer. A U-shaped pull-out drawer easily glides around your plumbing whether under a bathroom vanity or under the kitchen sink! One last space that a pull-out drawer is immeasurably handy is in a closet. No need to store precious sweaters or delicate silk shirts on hangers when you utilize a pull-out drawer. 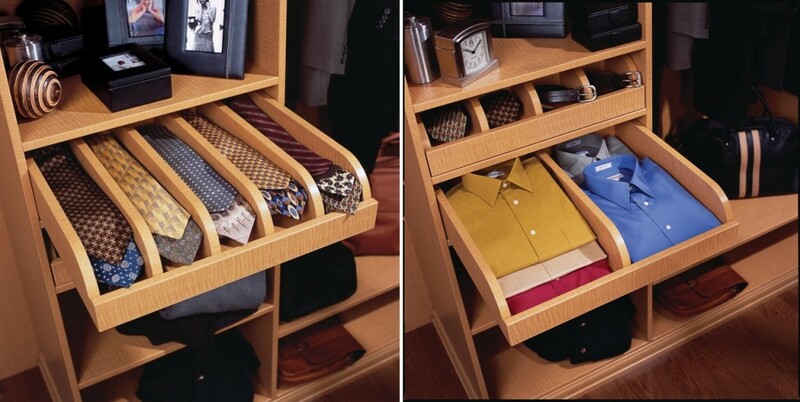 Ties, belts are also much more easily stored on a pull-out drawer. 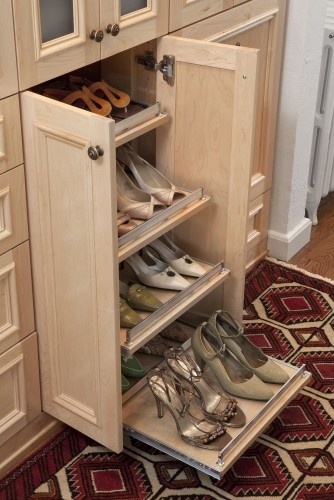 Shoes are also so easily stored on pull-out drawers. Since most closets are 20-24” in depth, you can often place shoes back to back on a pull-out. For all of those shoe divas out there, and I know there are a lot of you, this is especially important for your shoe collection storage. Often the material we create our pull-out drawers are white melamine or depending on your storage location, we can use birch or other natural woods. In one of our closets, we created the pull-outs with a high-gloss white, absolutely stunning!